Let’s be real, all of our parents have an arsenal of ways to annoy us. When you love someone, you have to tease ‘em a little bit every now and then. We all do this with our pets, too. Sometimes we point lights at walls that our cats want but can never catch or we pretend to throw the ball to our dog just to psych them out before we really do it. Just a little harmless fun. This dog has sprayed been sprayed with the hose one too many times by his human … and has had enough. Once he has the hose, he gets a taste of sweet, sweet vengeance and chases Dad all around the yard, happy to finally spray him back. This dog does what the rebellious teenager in us has always wanted to do – get back at our parents for teasing us. 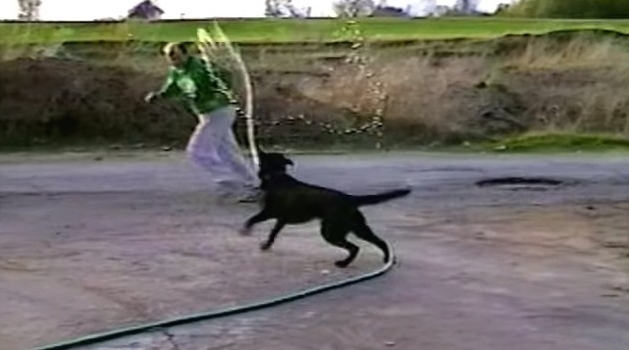 Responses to "Rebellious Dog Steals Hose and Sprays Dad Back (VIDEO)"